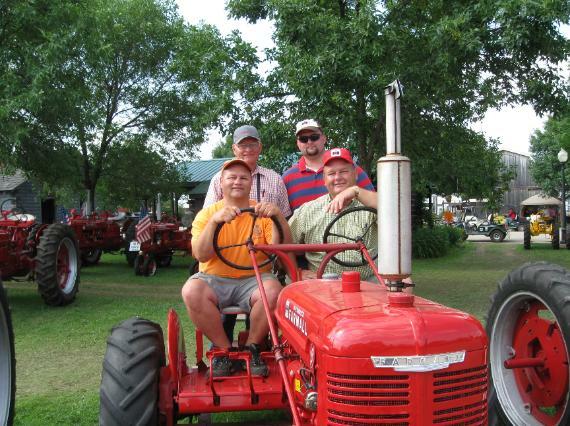 I have grown up around Red tractors and machinery all my life. 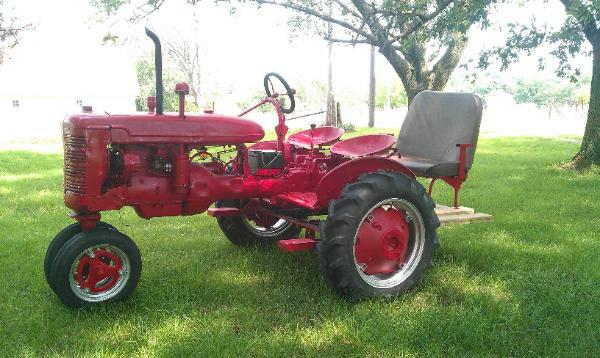 Being a fan of Red and a lover of history, I decided it was time to try my hand at tractor restoration. 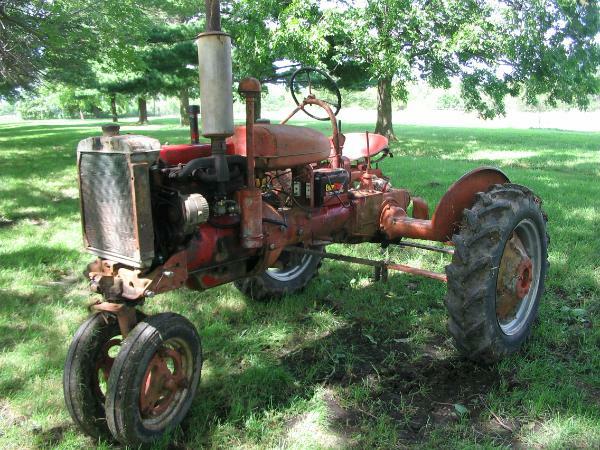 I chose a Farmall B for several reasons: First it was a small and simple tractor, it has a plentiful supply of both new and used parts, cost should be within my price range, and finally, the first tractor my father recalls from his childhood was when his father purchased a used B Farmall sometime in the late 1940s. After cruising the Internet in search of Bs, I came across a B advertised on Craig's List. 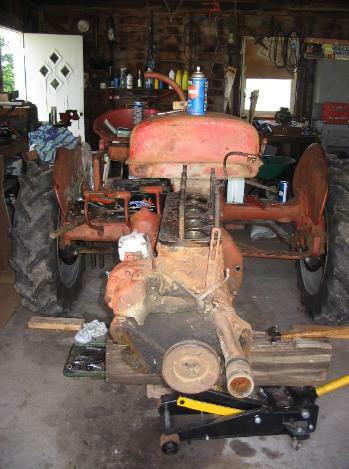 While it needed engine work, it had good tires on it which was just what I wanted. 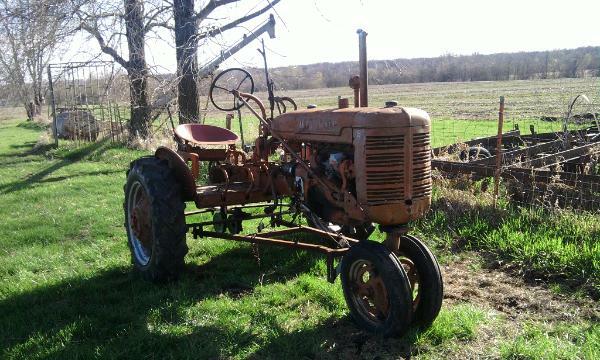 The tractor was located in North Missouri near Gentry. 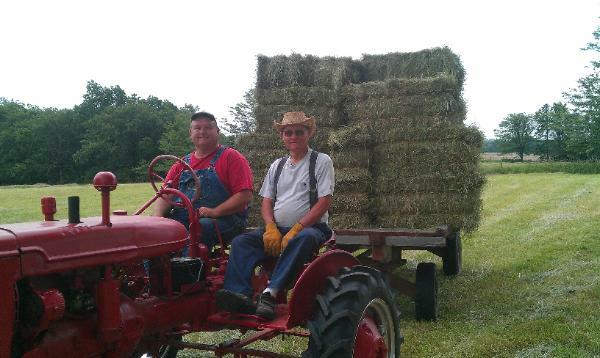 The next day, I traveled to a farm near Gentry to look at it, then went back the next day pulling a trailer. I purchased the B for $700.00 (April 2, 2010). 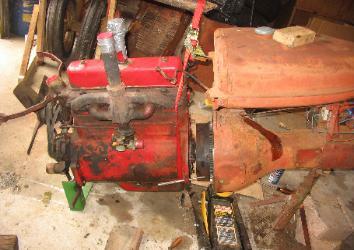 The owner included a used engine block which was telling of things to come. 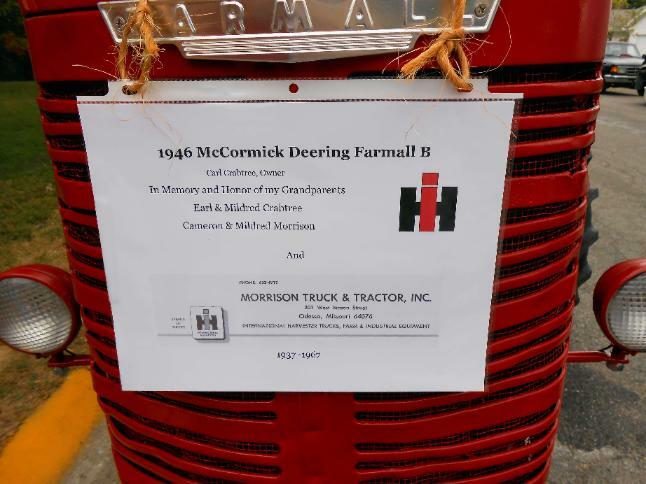 The first Farmall B was produced September 5, 1939 and production ran through 1947. 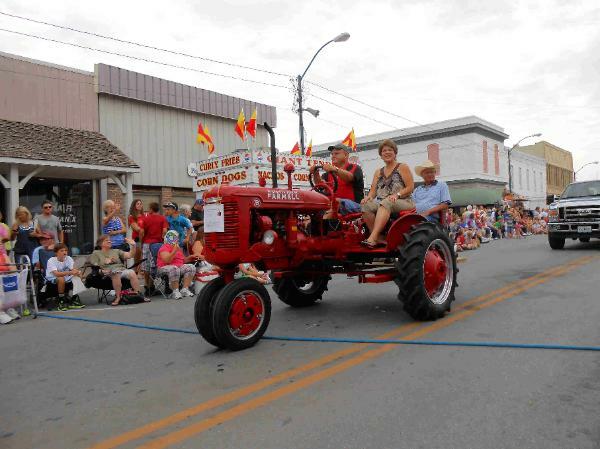 The Farmall A & B were developed to compete with the Allis-Chalmers B. 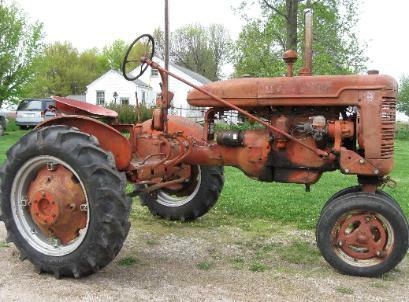 International Harvester developed their own "torque-tube" concept (narrow tube connecting engine and transmission) and later had to pay royalties to Allis-Chalmers for patient infringement. 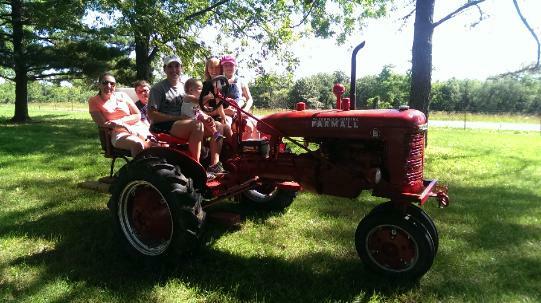 The Farmall B was targeted toward the smallest of farmers and in many cases replaced the draft horse. 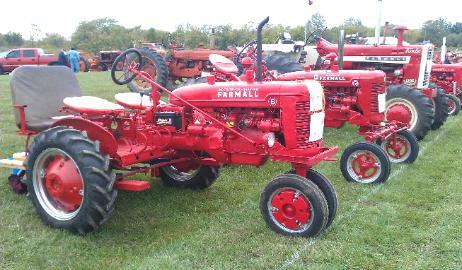 The Farmall B had a narrow front-end and the driver sat off-center, the Farmall A had a wide front end and the engine/powertrain was set off center. 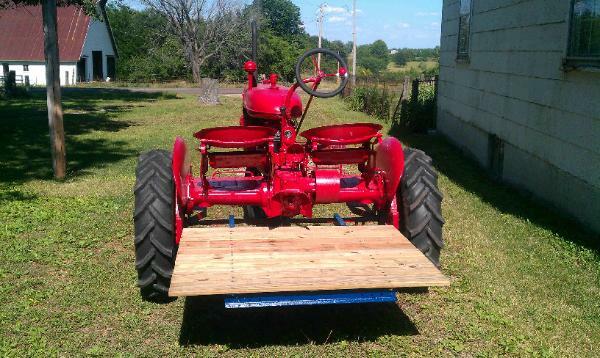 The purpose of the seat offset was for the operator to better see the crop rows they were cultivating. 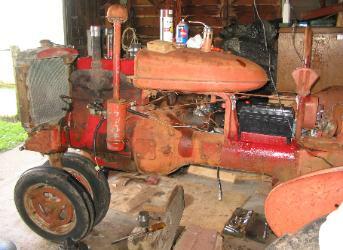 The Farmall B did not have hydraulics. 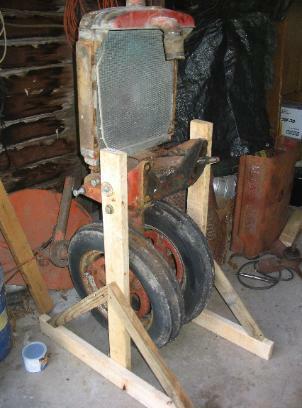 Early Bs may not have had an electric starter or even a place to put one in the casting, but instead used the hand crank. 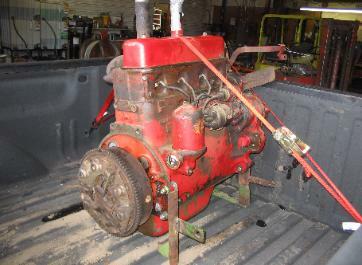 (In the 1950s, the 113 engine was increased to 123 cubic inches by increasing the piston bore). 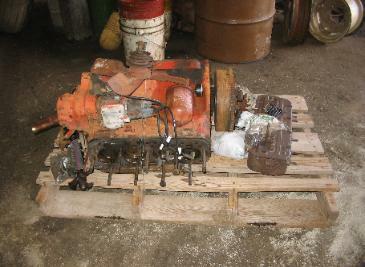 Transmission: 4 speeds forward, one reverse. 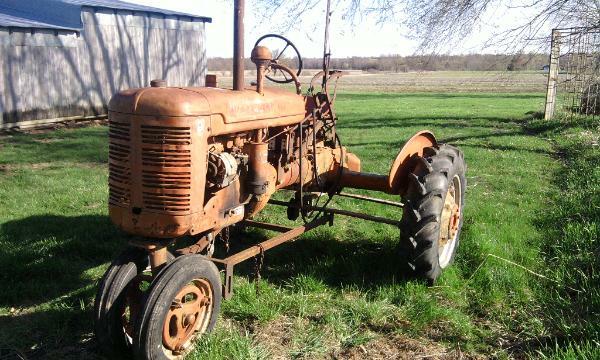 The Farmall B was replaced with the Farmall C in 1948. 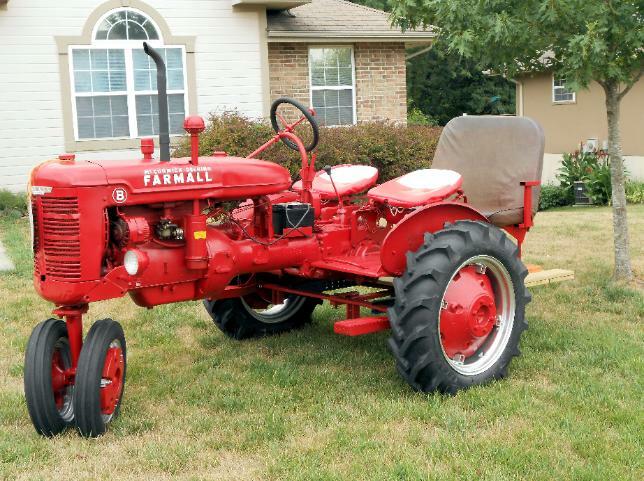 The Farmall A became a Super A, then 100, 130, and ended as the 140 spanning years 1939 - 1979. Back row: Robert and Aaron, Seated: Lee and Carl. I hope my B looks this good! Today I completed putting it together. My goal was to get her running! 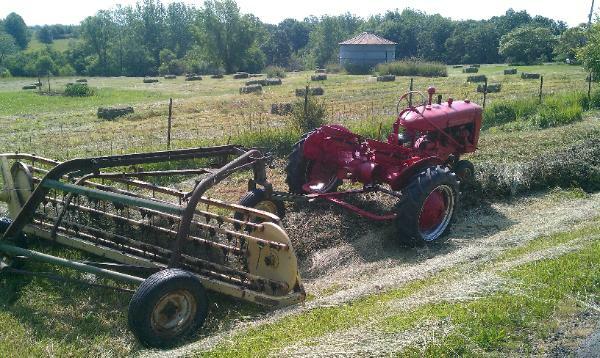 With little effort, the old Farmall B started and ran out well! Over the next few weeks I replaced much of the wiring, made a better place for the battery, repaired the throttle lever, scraped and cleaned. I drove it to town and washed it at the car wash. I noticed the transmission and/or rear end had some noise in it though it shifted with ease. It sounded like rough bearings or gears more than something going out. When I got home I decided to change the transmission and rear-end oil. When I pulled the plug, it appeared to be about half and half oil and water. I flushed it with diesel fuel and put in new 90 wt. Mineral oil. I think it will be fine. 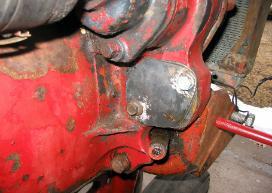 I also pulled the steering gear and replaced a bearing in an attempt to take some of the slack out of the steering. 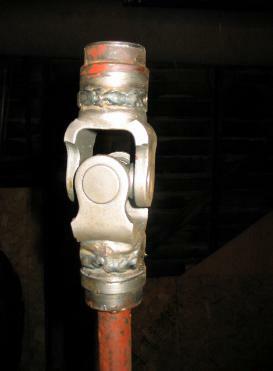 The steering universal joint was worn and my attempt to repair this turned into a story of it own, found later below. 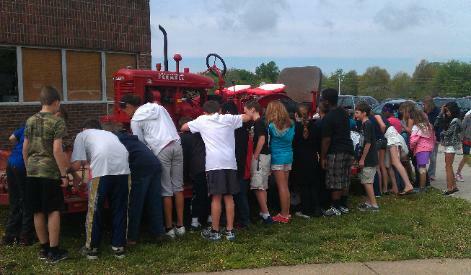 I was impressed with those who have added a second seat to their B Farmalls. While this was not factory original, it was simple enough to do. 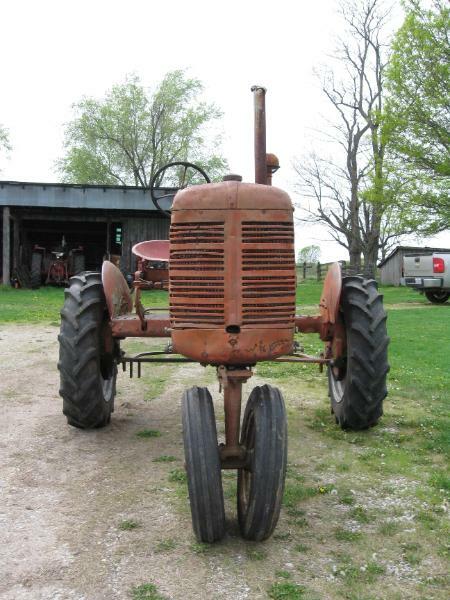 My dad recalled when he was a child he rode on the axle housing as his dad drove the tractor. 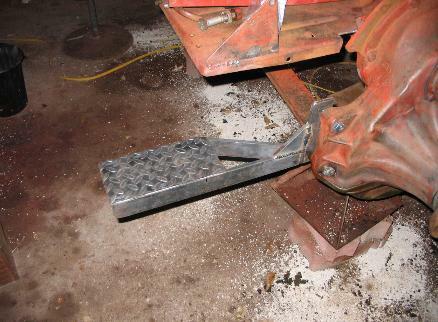 His feet could rest on the drawbar below. 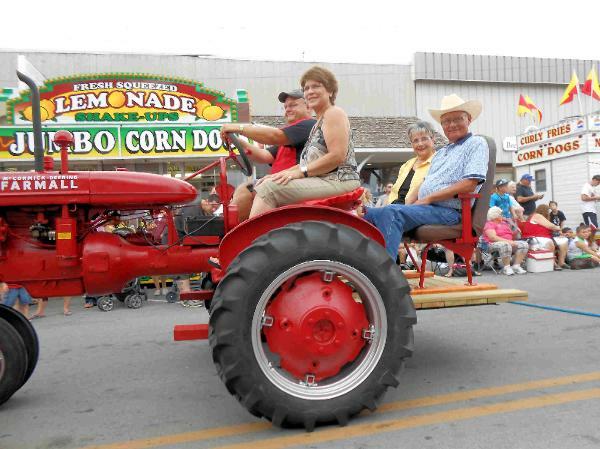 While this is a nice recollection, I did not think I could talk my wife into riding that way so I decided to add a seat. This would be great if and when I decided to parade my little B. 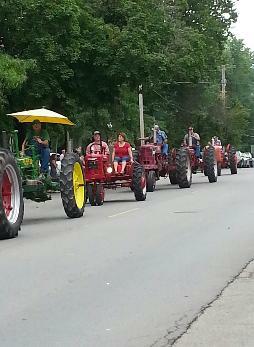 So, back to Cook Tractor in Clinton where I found a fairly good seat and platform. The hard part on this day was the bright sunshine and high temperatures around 100 degrees, with plenty of Midwest humidity to boot. 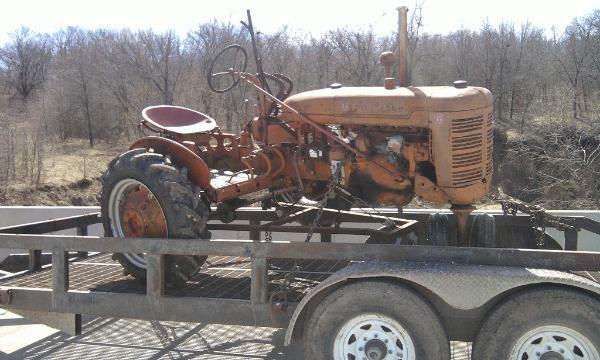 On top of that, I found that wasp love to make nests in old tractors and the heat only brings out their cranky side. Despite the heat and me tip-toeing around, I was able to remove the deck and seat assembly, without a torch! That weekend I installed it on my B with the aid of a cutting torch, welding on a support bracket, and a few choice words used at just the right time. Since the right and left sides of a B are nearly a mirror image, it was really quite simple. further observation, it look as though it was impossible to repair. There was no snap ring or other way to remove the bearing caps. cost of over $200.00, I sent it back and decided to make do. will last at least that long! was a no go. I was not surprised. I decided to tear into the engine. 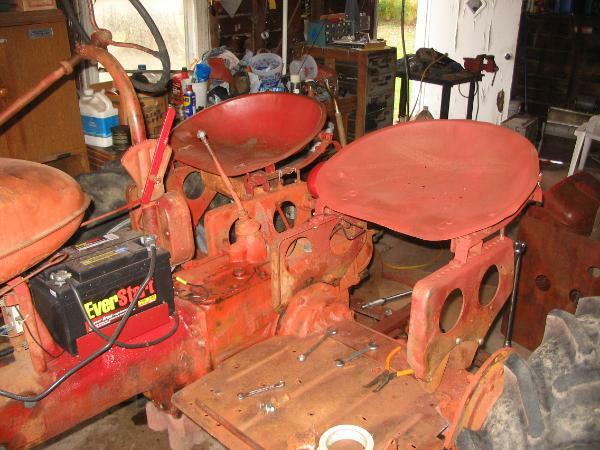 After removing the engine head, I took it to the local parts store for reconditioning. 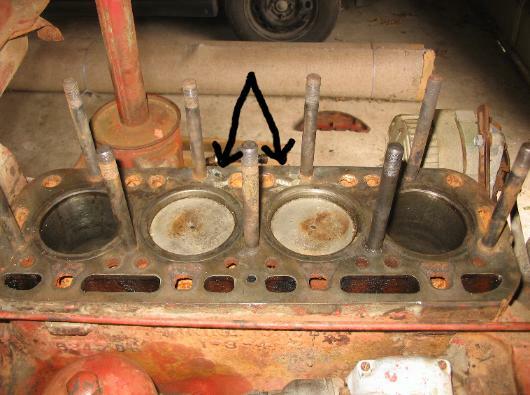 I had many doubts after discovering what looked like JB Weld both on the head and between cylinder's two and three on the block (see above). A day later they called and said the head was no good. After cleaning it they found multiple cracks. 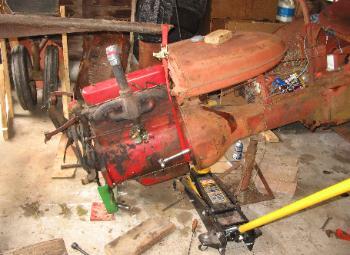 Decision time; should I overhaul this engine, overhaul the spare block, or look for another complete engine? 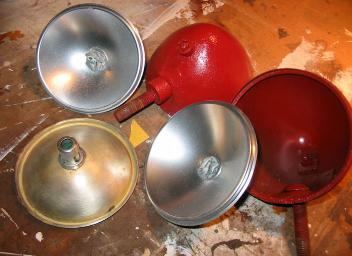 Since my last postings, I have painted and completed other minor repairs at a much slower pace. 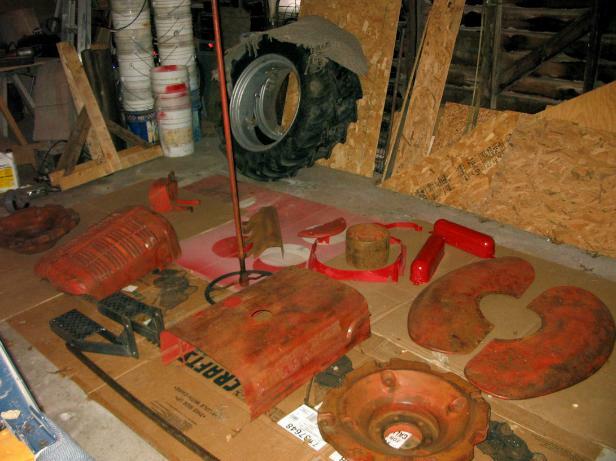 Farmall B and an array of tools.